You can connect Hipchat Server to Atlassian Crowd or to a Jira application (version 4.3 or later) for management of users and for authentication (verification of a user's login). You can connect Hipchat Server to Atlassian Crowd for user management and authentication. For more information on Crowd, see the Crowd Administration Guide. When to use this option: Connect to Crowd if you want to import and synchronize users from and authenticate those users against Crowd. You can't filter users. When you sync users, you'll sync all users in Atlassian Crowd. (Learn the workaround.) Hipchat Server marks inactive users from Crowd as deactivated users and doesn't count them towards your license. Crowd does not provide SSO functionality for Hipchat. Go to your Crowd Administration Console and define the Hipchat Server to Crowd. See the Crowd documentation: Adding an Application. Browse to your server's fully qualified domain name, for example https://hipchat.yourcompany.com/. Log into the Hipchat Server web user interface (UI) using your administrator email and password. Click Group admin > Authentication > External directory. Choose Add Directory then choose Atlassian Crowd. Enter the settings as described below. Note: There are no user group structures within Hipchat Server. Group data is synchronized, but not used. 読み取り/書き込み Not applicable to Hipchat Server. Not applicable to Hipchat Server. When you sync your users, you'll sync every user that exists in the directory. You can't filter users. When you sync users, you'll sync all users in the Jira application. Hipchat Server marks inactive users from the Jira application as deactivated users and doesn't count them towards your license. Log in to the Jira application as a user with the 'Jira Administrators' global permission. Choose > User Management > User Server. Keyboard shortcut: 'g' + 'g' + start typing 'jira user'. Enter the application name and password that Hipchat Server will use when accessing the Jira application. Enter the IP address or addresses of Hipchat Server. Choose Add Directory then choose Atlassian Jira. Enter the settings as described below. Enter the settings as described below. When asked for the application name and password, enter the values that you defined in the settings on the Jira application. Define the directory order by clicking the blue up- and down-arrows next to each directory in the User Directories list. The order of the directories is the order in which they will be searched for users. Changes to users will be made only in the first directory where the application has permission to make changes. The application name that Hipchat Server will use when accessing the Jira application. The password that Hipchat Server will use when accessing the Jira server that acts as user manager. The users, groups and memberships in this directory are retrieved from the Jira server that is acting as user manager. They can only be modified via that Jira server. 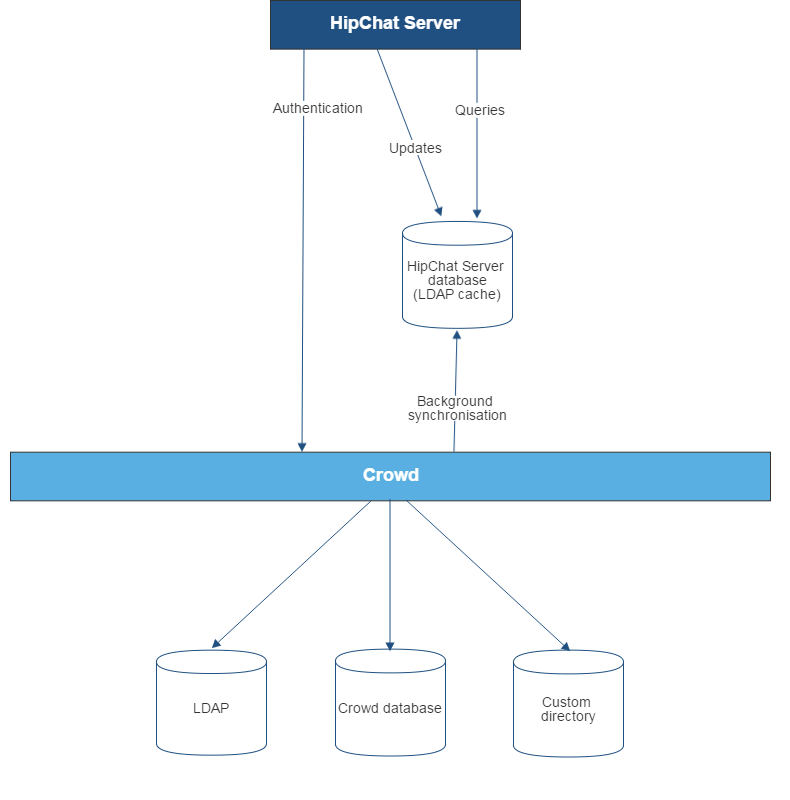 Diagram above: Hipchat Server connecting to Crowd for user management. Diagram above: Hipchat Server connecting to a Jira application for user management. The Jira application does the user management, storing the user data in its internal directory. 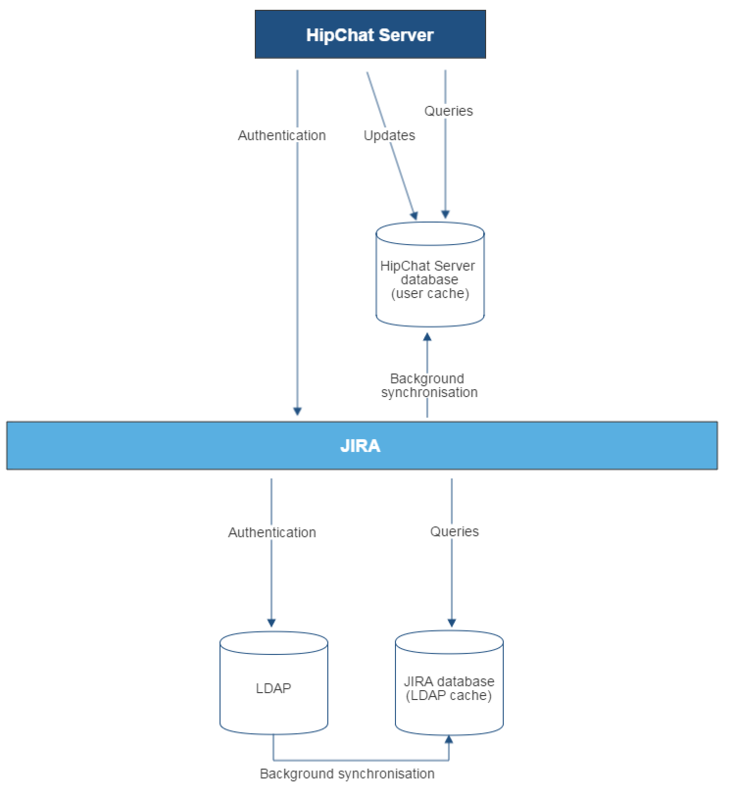 Diagram above: Hipchat Server connecting to a Jira application for user management, with the Jira application in turn connecting to an LDAP server.